God is so good! Today’s radio interviews with two of the contributing writers for my newest ebook, The Hands Of A Woman: Everyday Women In Everyday Battles went well. If you missed these interviews, you can still listen to the replay by clicking on this Talkshoe link. Theirs are the top two listed on “Past Episodes.” Jane VanOsdol’s interview is there as well, which went great. You can either listen there or download them to your computer or Ipad. This coming week I’ll be interviewing more of the writers so stay tuned for details. This is your chance to “Meet The Authors” of this ebook, and get to know them a little better. Do you have your ebook copy yet? 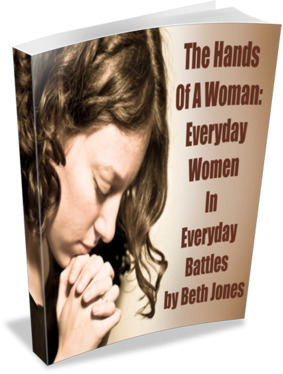 The stories of women’s struggles and spiritual battles are powerful and will move you. Right now you can still get the 25% special discount discount on the price of the book, that is for a limited time. The price right now for the ebook is just $15, which includes my study guide that covers each of the 10 chapters, and Cindy Rushton’s wonderful Castles Under Fire audio bundle set. To find out more info, go here. Some of the struggles the women share in this ebook are about marriage problems, financial struggles, childhood sexual and physical abuse, a spouse with a drug addiction, the loss of a child, women struggling with depression and fear, and more.